The ultimate success of gene and cell therapy products relies on the seamless delivery of a potent drug product to patients. The pharmaceutical supply chain is inherently complex; however, gene therapies face additional roadblocks such as ever-changing regulatory compliance, chain of custody due to the personalized nature of autologous therapies, patient demand, and scalability from clinical to commercial. Moreover, the complexity of the delivery process is exacerbated by the temperature- and time-sensitive nature of immunotherapy products. Many gene therapy products and intermediates need to be stabilized by either cryogenic perseveration or refrigeration (2–8°C) during storage and transport with limited or no allowable temperature excursion. At each critical transfer point (e.g., transfer from manufacturing facility to frozen shipper), the frozen therapy product is exposed to ambient temperatures: for material stored at dry ice temperatures, which is generally -78°C, the difference is about 105°C, while for cryogenically deep-frozen product, the difference is around 200°C. Even if the exposure only lasts for seconds, a 200°C gradient in temperature potentially represents a severe and irreversible degree of thermal shock. The temperature gradient of preconditioned refrigerated product (e.g., apheresis material) with ambient temperature for refrigerated shipment is less extreme and more manageable than that of a frozen shipment. Improper and interrupted temperature-controlled transport of gene therapy products could potentially affect the quality of these products, which could lead to the loss of millions of dollars’ worth of products, as well as compromise patient safety. Rectifying this kind of error would constitute troubleshooting the underlying supply chain issues and re-manufacturing personalized immunotherapy products, which starts from the apheresis process. Alarmingly, using unqualified and improper shipping systems is common in the gene therapy field, at times allowing temperatures which fluctuate from -40°C to 40°C during the same shipment. Temperature-controlled packages used for the transport of immunotherapy products use a combination of thermal insulators or thermoregulators to decrease the heat transfer rate from outside of the shipper to the inside. The overall design of the package is pivotal in achieving the minimal heat transfer rate. In this two-part article, we will explore common methods of temperature-controlled transportation and delve into their pros and cons. In Part 1, we focus on passive cryogenic options. Dry vapor (Dewar) shippers are designed to hold gaseous nitrogen for transportation of gene therapy products at cryogenic (-150°C or lower) temperatures. These shippers are composed of a metallic vacuum flask that has a cavity for holding the therapy material in the inner chamber. The vacuum-insulated panels (VIPs) are made of durable material that can withstand extreme temperature fluctuations. The circular chamber of the dry vapor shipper is surrounded by a high surface-area, low-density, porous, absorbent foam material. This material holds the evaporated nitrogen and provides a long release time of vapor nitrogen, thus maintaining, theoretically, temperatures of -196°C during transit. Each dry vapor shipper should be charged with LN2 prior to shipment. The charging is performed by either a third-party logistics (3PL) company prior to shipment to the end user or by the end user prior to shipment to clinical sites. Dry vapor shippers should be periodically returned to the manufacturer for refurbishment. The refurbishment process includes cleaning, vacuum check of VIPs, nitrogen evaporation rate check (which corresponds to thermal efficiency of dry vapor shippers), and nitrogen capacity check (which measures the absorbed nitrogen by the retention media inside the Dewar). Most LN2 dry vapor shippers include sensors that provide comprehensive information on the chain of condition (e.g., temperature, light, orientation, altitude, shock, vibration) and chain of custody (e.g., GPS, critical-control-point mapping) to ensure compliance with regulatory agencies and to safeguard patients. The light sensor is activated when the LN2 unit is opened, hence serving as a tamper-evident feature. The major drawback of dry vapor shipping systems is that their performance is undermined when not placed in the upright orientation. In reality, even when labeled appropriately, dry vapor shippers are frequently tipped on their sides during transport, leading to an increased evaporation rate and hence reducing thermal longevity. A unit that is tipped over on its side maintains approximately 60 percent of static hold time. A unit placed upside-down only maintains approximately 10 percent of static hold time. Given these foreseen variables, it is imperative that the chosen dry vapor units allow for the longest reasonable hold times and are validated under both static (upright orientation) and dynamic (side orientation) conditions. As many gene therapy products have minimal resistance to temperature fluctuations, attempts should be made to reduce the exposure time to ambient temperature during packing (i.e., product transfer from a freezer to a shipping system) and unpacking (i.e., product transfer from a shipping system to a freezer). LN2 is classified as dangerous goods by three regulatory agencies: the Department of Transportation (DOT), International Air Transport Association (IATA), and International Civil Aviation Organization. Labeling and packaging requirements should be met per the above regulatory bodies. Although LN2 is a hazardous material, a properly prepared dry vapor shipper is not. Dry ice is the solid form of carbon dioxide that sublimates at -78.5°C at sea level. Generally, dry ice parcel-sized shippers for gene therapy products comprise the payload area surrounded by insulation medium (e.g., Styrofoam, polyurethane foam, and VIPs) and dry ice trays designed to hold either dry ice pellets or blocks. This basic construction allows dry ice shippers to be handled without restrictions. Due to the lower surface area of dry ice blocks, the sublimation rate is significantly lower than dry ice pellets for the constant mass of dry ice. Ideally, the payload should be situated at the center of the shipper interior surrounded by dry ice at all six faces, leading to a homogenous temperature distribution and stability inside shippers. Another objective of this central payload design is to minimize thermal contact between the payload and the shipper wall — a location where the amount of heat flow from the external atmosphere is at a maximum. Each dry ice tray could be equipped with corrugated inserts that minimize the movement of dry ice pellets with respect to a payload in case of shipper misorientation during transport. Sublimation rate of dry ice inside the shipper decreases from top to bottom as hot air rises to the top of the shipper, consuming dry ice, and becomes cold on top. As hot air cools, it sinks back to the bottom of the shipper and the motion cycle continues — also known as convection currents. Void space in parcel-sized dry ice shipping systems should be avoided both from thermal and physical perspectives. From a physical point of view, extra space would increase the likelihood of dry ice and payload movement, leading to potential damage. From a thermal point of view, air circulation in void space would reduce the efficacy of thermal isolation of the payload from external temperature. Ideally, any dry ice shipper should be developed contemplating a potential replenishment step, in case extended qualified duration is required due to flight delays or customs holds. In most cases, customs holds last for 24 to 48 hours, but in some countries they can take considerably longer. In addition, the time needed to prepare and administer a gene therapy product to the patient once the unit arrives at the clinical site should also be considered. Gene therapy companies must add a safety factor for situations mentioned above into their temperature hold requirements. 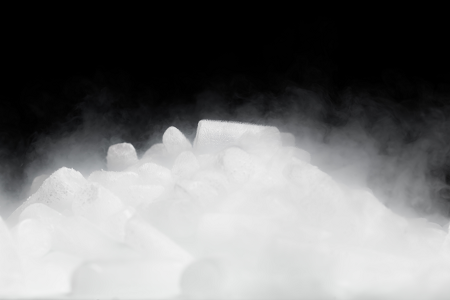 Packaging materials that are chosen to be included inside dry ice shippers should not be rendered nonfunctional (e.g., brittle and permeable) by the temperature of dry ice. Additionally, the packaging material should be robust enough to prevent any loss of contents from vibration, shock, humidity, and change in pressure (altitude). The package should be designed to allow the release of carbon dioxide from the shipper, reducing the likelihood of shipper explosion. Volume of the autologous cell therapies is the major consideration in designing dry ice shipping systems. Shifting from clinical to commercial operations could become a monumental logistical challenge if all volumes of immunotherapy drugs, from minimum to maximum load, are not considered during the design stage of the dry ice shipping system. Contact hazard — Dry ice causes severe frostbite upon contact with skin. Appropriate personal protection equipment such as cryogenic gloves should be used when handling dry ice. Suffocation hazard — Carbon dioxide released in a confined space may displace oxygen in the atmosphere and cause hypercapnia. Explosion hazard — The accumulated pressure from a large volume of carbon dioxide gas inside a closed container could cause an explosion. Dry ice shippers, in comparison with Dewars, have a significantly lower capital cost and can be stock-held to provide volume flexibility. Dewars, compared to dry ice shippers, maintain the payload temperature at lower temperatures for an extended period — up to 20 days. In Part 1 of this two-part article, common cryogenic shipping methods for gene therapy products were presented and pros and cons of each method were discussed. A suitable temperature-controlled method of transportation should be chosen by utilizing a risk-based approach that takes into account various product, logistics, manufacturing, and procedure characteristics. Part 2 addresses shipping systems used to transport apheresis material or other gene therapy products that require 2–8°C temperature control.